Animal Family Pet Preservation is a full-time, fully-staffed taxidermy studio, specializing in the preservation and lifelike reconstruction of household pets. We have been doing pet preservation since 1993. Our approach to pet taxidermy, our methods, and our level of customer care and understanding all lead to a superior product and experience. Once you call Animal Family Pet Preservation, you will feel better about your decision to preserve your pet. Don’t just browse our great website, call us we can help! 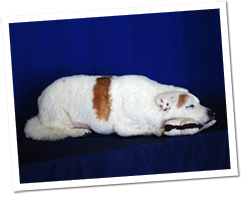 At Animal Family Advanced Pet Preservation, you will discover that compassionate, reliable answers to your questions regarding Freeze Dry pet preservation are available to you. We have been in the art of pet preservation since 1993, and our proprietary techniques are advanced and distinct from all other methods of pet preservation currently available. This is recognized as such by both our nationwide customer base, as well as our peers, evidenced by our multiple ribbons and awards at numerous freeze-dry and conventional taxidermy competitions. When you contact Animal Family, you most likely will be most impressed by our staff. We are truly a family operation. Our “Animal Family” includes dogs, cats, reptiles, birds, and fish. We, like you, have experienced the loss of a pet, and the daily joy of sharing our home with them. We understand how you feel, that your pet is part of your family, and we are here to help you cope with your loss in a dignified and sympathetic manner. We will never “push” you, in fact we recommend that you call us before you lose your pet, so that you can make a decision while not having at the same time to cope with the grief and emotion that you naturally feel at this difficult time. Pet preservation is one of the most important decisions you will ever make regarding your family pet, and we want to help you simplify the process, and make a choice that leaves you at peace. We can offer a LIFETIME GUARANTEE on your preserved pet. No smell, no leaks, no bugs…ever. No other pet preservationist in the country offers this guarantee. And if you ever damage your pet accidentally, we will repair it for free, you just pay for shipping.